Most air filters operate via a method known as surface filtration. The size and number of the holes in this surface, determining the quality of filtration and performance. But once the surface is coated in dust and debris, the holes are blocked and they no longer perform. 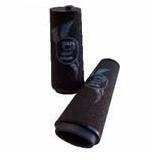 This type of filtration includes all paper elements and cotton mesh style filters. Cotton mesh style filters have a reputation for good performance, but this technology is over forty years old and requires constant cleaning to maintain good flow. Every time they are cleaned the surface quality is damaged, resulting in either poor filtration or performance. Paper filters require regular replacement, and only provide adequate performance. Buy a ITG filter for my car. With surface filtration, the performance of your vehicle is in a steady decline from the day the filter is installed, to the day it is replaced or cleaned. If it is cleaned then its life expectancy and filtration quality are limited. 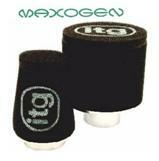 Most foam filters on the market also come under the heading of surface filtration. As they only consist of one density of material or have a fine density material as the first layer of filtration. Also requiring frequent cleaning to maintain performance. True Depth Filtration can only be achieved by using a multi-density material. ITG achieve this by using a three-layer filtration system. Each layer of foam having different levels of filtration, course on the outside, medium in the center and fine on the inside. The dust particles are stopped at the relevant depth, still allowing the air around and through the filter. 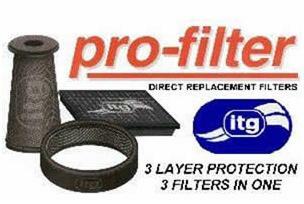 ITG filters, because of their superior design are able to cope with over five times the dust load-up of any other filter and still perform. Requiring less maintenance means a greater service life. We even have filters with the ability of running for one hundred and sixty thousand kilometers (160,000 km) without cleaning. These filters have a special oil which is applied during the construction of the filter. This can still be cleaned if required. The best way of cleaning ITG air filters is to first brush off any large surface debris, then use a vacuum cleaner (not compressed air) on the outside surface to remove the dust the way it went in, prior to and in some cases instead of, any use of detergent or petrol bath cleaning. This is the way to get the best value from your filter. The technology of ‘Reticulated Polyester foam’ allows us greater flexibility in design and performance than paper or other filter technologies. This gives us the opportunity to make an air filter to your exact specification. 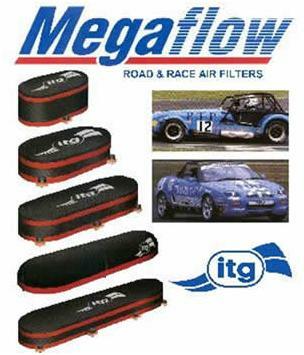 ITG were perhaps the first to make a truly durable and high performance foam based production air filter. This heritage has stood us in good stead throughout the competition world for nearly a generation. By using various thicknesses of finer or coarser foams, our designers can vary the above factors to achieve the optimum for each application. It has shown the small quantities of dust particles smaller than 10 microns have no significant effect on engine wear, so the materials used in our range of filters have been carefully selected to give good air flow capacity, excellent load-up tolerance, and high efficiency whilst avoiding unnecessary extraction. Where high dust flow rates are possible, we tailor the filters to arrest even the slightest dust. In addition, our filter construction reduces noise significantly, when compared with competing designs. 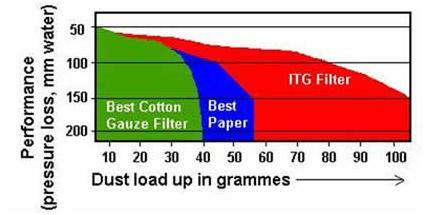 Although any competition-type filter will lead to an increase in noise over original equipment, an ITG filter will probably give more power for longer, whilst remaining quieter than other competition filter types. Our filter materials have benefited from new technology in the way we bond the selected layers of foam to each other. The adhesive used in filter assembly have to be resistant to water, fumes, oils and fuels (including exotic brews for racing).